Harrison, Harry. West of Eden . Bantam 1984. What if: The KT extinction event never occurred, and dinosaurs continued to live and evolve. Series note: Series composed of West of Eden , Winter in Eden , and Return to Eden . Comments: Synopsis in Lodi-Ribeiro's "Histórias Naturais Alternativas", q.v. Translation: Italian of complete trilogy by Gianluigi Zuddas as Il libro degli Yilanèg , Nord 1997 (8842909874). Harrison, Harry. 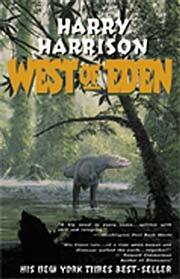 West of Eden . ibooks 2000. Summary: Millions of years later, saurian Yilané from the cooling Old World establish a colony on the northern continent of the New, and there encounter large mammals, including the sapient ustuzou. One captured ustuzou later becomes their worst enemy. 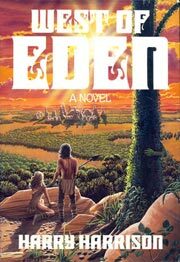 Series note: First in the Eden Trilogy. Published: Bantam 1984 (0553050656BUY), 1985 (0553249355BUY, <<0553265512>); Granada 1984 (0246120029), 1985 (058605781); SFBC 1985; Grafton 1985 (0586057811BUY); ibooks 2000 (0743400135BUY), 2004 (0743487184BUY). Translation: Czech by Martin Janda as Na zapad od raje , Laser 1995 (8071930091). Translation: Nederlands by Annemarie Lodewijk as Ten Westen van Eden , Meulenhoff 1991 (9029042494). Translation: German by Walter Brumm as Diesseits von Eden , Goldmann 1984 (3442084091), 1990 (3442234603), 1991 (3442410894). Translation: Italian by Gianluigi Zuddas as L'ègra degli Yilanè , Nord 1989 (8842903965), 1997 (8842909874). Translation: Polish by Janusz Pultyn as Na zachod od Edenu , Phantom 1992. Translation: Portuguese by Ana Maria Falcão as A Oeste do Éden , Gradiva 1986. Translation: Spanish by Domingo Santos as Al oeste del Edén , Destino 1988 (8423316521). Harrison, Harry. Winter in Eden . Bantam 1986. Summary: The conflict between Yilané and ustuzou is rejoined as the saurians try to regain their lost colony. Meanwhile, a group of renegade Yilané establish a colony in a region thought to be unexplored. 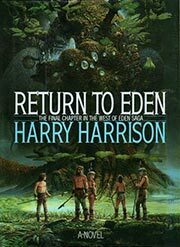 Series note: Second in the Eden Trilogy. Published: Grafton 1986 (0246126124), 1987 (0586064796); Bantam/Spectra 1986 (0553051636BUY), 1987 (0553268201BUY, 0553266284BUY); SFBC 1987; ibooks 2001 (0743412915BUY). Translation: Czech by Martin Janda as Zima v raji , [[publ. unknown]] 1999. Translation: Nederlands by Annemarie Lodewijk as Winter in Eden , Meulenhoff 1992 (9029044586). Translation: German by Angelika Weidmann as Winter in Eden , Goldmann 1992 (3442412250). Translation: Italian by Gianluigi Zuddas as Il nemico degli Yilanèg , Nord 1990 (884290404X). Translation: Polish by Janusz Pultyn as Zima w Edenie , Phantom 1992. Translation: Spanish by Domingo Santos as Invierno en Edén , Destino 1989 (8423317919). Harrison, Harry. Return to Eden . Bantam/Spectra 1988. Summary: The series concludes as feuds are resolved and other loose threads are collected. 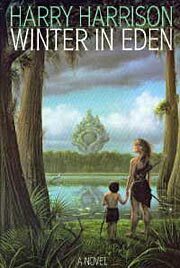 Series note: Third in the Eden Trilogy. Published: Bantam/Spectra 1988 (0553053159BUY), 1989 (0553277006BUY); SFBC 1988; Grafton 1988 (0246133805), 1989 (0586064818); ibooks 2001 (0743423747BUY). Translation: Czech by Jana Reekova as Navrat do raje , Laser 2000. Translation: Nederlands by Annemarie Lodewijk as Terugkeer naar Eden , Meulenhoff 1993 (9029046406). Translation: German by Angelika Weidmann as Rueckkehr nach Eden , Goldmann 1992 (3442411432). Translation: Italian by Gianluigi Zuddas as Scontro finale , Nord 1990 (8842904090). Translation: Polish by Janusz Pultyn as Powrot do Edenu , Phantom 1992. Translation: Spanish by Domingo Santos as Regreso a Edén , Destino 1990 (8423319237).